We are manufacturers of FRP Pipe. 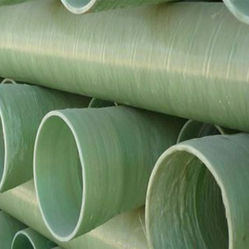 Our Glass Fibreglass Reinforced Plastic (GRP) Pipes are made of Filament winding process. They have corrosion/Abrasion resistance suitable for various industries like Chemical process, Petrol Chemical, Marine Offshore, Pharma, Food Processing, Power Plants, Pulp & Paper, Waste Water Treament, Mining and Metal Refining. GRP/FRP Pipes are used in various applications like Aeration, Brine Slurry, Bottom Ash, Chemical Feed, Column Piping, Condesate Return, Cooling water, Disposal Wells, Effulent Drains, Fire Mains, Flue Gas Desulfurization, Guttering, Oily water, Scrubber Headers, Seawater, Slurry, Vents, Water, Gasoline. 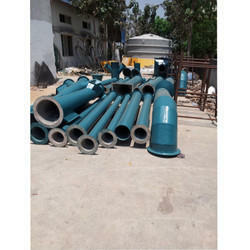 Our GRP/FRP Pipes are made of Filament winding process. They have corrosion/Abrasion resistance suitable for various industries like Chemical process, Petrol Chemical, Marine Offshore, Pharma, Food Processing, Power Plants, Pulp & Paper, Waste Water Treament, Mining and Metal Refining. GRP/FRP Pipes are used in various applications like Aeration, Brine Slurry, Bottom Ash, Chemical Feed, Column Piping, Condesate Return, Cooling water, Disposal Wells, Effulent Drains, Fire Mains, Flue Gas Desulfurization, Guttering, Oily water, Scrubber Headers, Seawater, Slurry, Vents, Water, Gasoline. We are offering FRP Pipe to our clients. 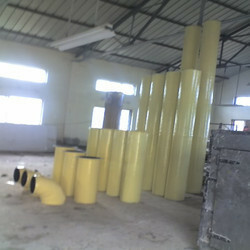 We are offering FRP Pipes Bends to our clients. Looking for FRP Pipe ?